Synopsis (of Vol. 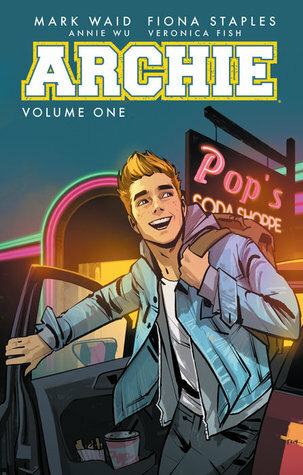 1): America’s Favorite Teenager, Archie Andrews, is reborn in the pages of this must-have graphic novel collecting the first six issues of the comic book series that everyone is talking about. Meet Riverdale High teen Archie, his oddball, food-loving best friend Jughead, girl-next-door Betty and well-to-do snob Veronica Lodge as they embark on a modern reimagining of the beloved Archie world. It’s all here: the love triangle, friendship, humor, charm and lots of fun – but with a decidedly modern twist. So for those of you who were unaware, I absolutely love the tv show "Riverdale". It is definitely one of my guilty pleasures. I was a little unsure of it in the beginning, but I became hooked. What can I say, I love murder and small town drama. This sparked me to read to read "Archie (2015)", the graphic novel series. Going into the series, I had no doubt that it was going to be quite different than the tv series, and it is, but in a way that works. Both worlds have their own take on the characters and the drama/storylines, and both takes are entertaining. It's interesting because some of the characters, like Jughead, are pretty much the same across both outlets (which I LOVVEEE because Jughead is my favorite), while other characters are completely different or certain aspects of one character can be seen in another character. For example, I absolutely hate Betty in the tv show "Riverdale". Just about everything about her pisses me off. But in the graphic novels, she is basically a completely different person, and I love it. She's a strong tomboy who is so smart and capable. Don't get me wrong, tv show Betty is pretty smart and capable too, but she's soooo annoying and her priorities are all out of wack. I just can relate to graphic novel Betty more. Plot-wise, I enjoy Riverdale wayyyy more than the graphic novel series, but that's because the tv show is darker and more dramatic, something the graphic definitely isn't, which is fine. These graphic novels are more along the lines of the carefree antics of the original comic series with a lot of the plot centered around the love triangle with Archie, Veronica, and Betty. I'm a little annoyed at how much of the plot focused around Veronica and Archie, mainly cause I also don't like Veronica, but it is what it is. One thing that kinda surprised me in this series is how involved Mr. Lodge was. He was quite a focal point in the story and was very involved, unlike Mr. Lodge in the tv series. I'm interested to see how Mr. Lodge is portrayed in the tv series because even though the graphic novel version is pretty big and somewhat intimidating, I have a feeling the tv version will be wayyy darker and quite the scary enemy. Overall I really enjoy this series and will continue to read it. I've also decided I'm going to read the companion "Jughead" series because Jughead is my son and Sabrina the Teenage Witch is in it and I love her sooooo much and I'm super excited to see the two of them together. So if you haven't read this series, I highly recommend it, especially if you're a "Riverdale" fan, which speaking of, the season 2 finale is this Wednesday! I'm so excited. I think I'm going to start writing reviews for the episodes on here as well as live-tweeting. I use to live-react on Tumblr to my favorite shows and it honestly gave me so much life, so I want to bring that back and incorporate it with my blog since tv really is a huge part of my life and what makes me happy.